I don’t want to get fitted for a tin foil hat, but why the heck would you do this? This idea is failing so obiviously, so conclusively, it boggles the mind that an elected official is saying, “Yeah, lets do that here!”. 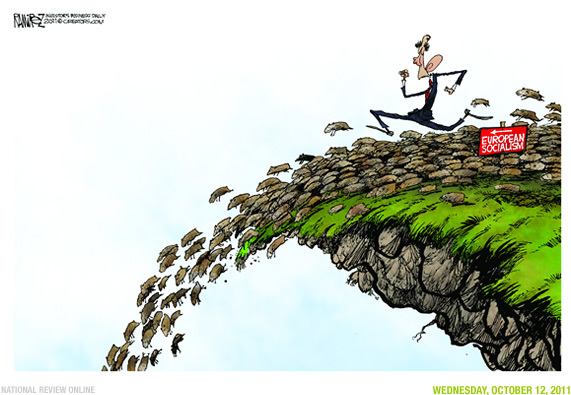 Lemmings don’t really do this. European socialists and Presbo do. Lemmings don’t really do that. As the low-incentives decline takes root, American voters will react in predictable suicidal fashion: “I don’t care about anything any more. I’m desperate! Take form wherever, take from whoever, and give me, I don’t care how much you waste or how much you keep, just give me to get by the next two years”. Those of us who have lived in Europe, have been seeing this movie been played for the last few decades.